We’re now a full month into the new year, and I’ve been neglecting this blog a lot since I finished hiking the Pacific Crest Trail. Partly because the holidays and work were a little crazy, and partly because I was feeling a little uninspired and removed from the outdoors since coming back home. I’m hoping to grow this blog more in the coming year: more gear reviews, more trail journals, and more photography, possibly debuting a print shop by the end of the year. I have lots of goals for myself this year in numerous categories: personal health, photography, this website, work, trips, finance, and more. It is silly to think that I will accomplish all of these things, but I’m going to try, while remaining balanced. Why does this matter here? Well, this is my blog, so I get to write what I want, but also, it will impact the content that I am putting out. In addition to all of the goal categories I listed above, a big goal of mine for this year, in the effort of balance, is to do 1 “outdoorsy” thing per month. Coming off hiking every day for 5 months was weird, and I had a hard time transitioning into a more “weekend warrior” model. And with working retail, it feels impossible to actually use my Saturdays and Sundays to their fullest extent. So instead of putting pressure on myself to use all of my days off solely for the outdoors, just for the sake of getting out, I’m focusing on doing something I really want to do once per month. With that, I’m going to be showcasing those monthly adventures in a blog post, so you will definitely be seeing at least one blog post per month. I am going to be moving away from individual trip reports on hikes, just because I don’t find a lot of joy in it, and instead focus “trip reports” on “how-to’s” for certain, more popular, trips, and photo/ trip journals for trips that are not solely hiking. This is subject to change based on how I want to talk about a trip, and I may write some in a trip report format if I feel like that’s what it deserves. In addition to the monthly activity update, I’m making it a goal of mine to post at least one gear review per month. So, let me know if you’re dying to hear a review from me about a piece of gear I use, and I’ll be sure to prioritize those items first. I’m not ready to make a big announcement yet because of permit situations, and I haven’t officially talked to my managers at work about it, but I guarantee you, I will be doing another thru-hike this summer. It’s not going to be one of the big three, or anything international, but most likely the Colorado Trail, Tahoe Rim Trail, Wonderland Trail or High Sierra Trail. Or a combination of some of those. I do have the thru-hiking bug, so you can anticipate seeing a thru-hike every year from now on, with content related to planning, post-hike musings and lessons learned, and of course, a trail journal. Finally, I do write this blog for myself, first and foremost, but I also write it for all of my readers (idk how many of you there are… but thanks for stopping by!). So, I do care about what you want to read from me. That being said, please contact me by e-mail, or comment here if there’s a certain type of content you want to see, or a certain advice piece, or anything really! And, if you are interested in seeing a print shop from me, definitely let me know, and let me know a photograph you’d like to see in it. A print shop can be a lot of work, and since I’m not pursuing photography full-time, I’m only going to put the effort into it if you all really want it! Thanks again to everyone for following along on all of my adventures, commenting on Instagram pictures, and loving the outdoors with me! 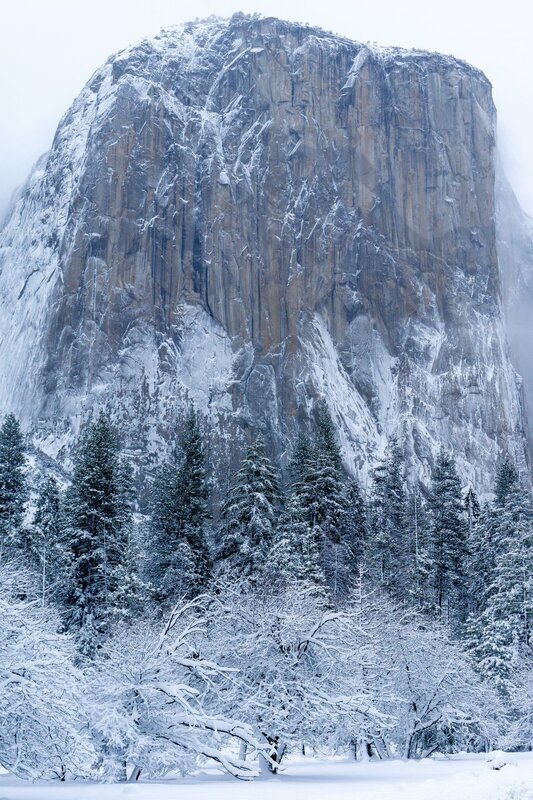 One of my goals when I moved back home was to visit Yosemite. 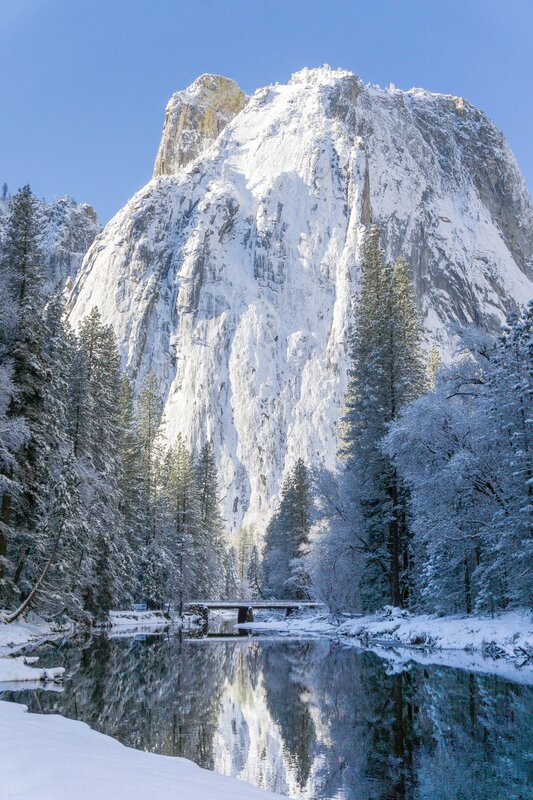 And my goal once I saw Yosemite in the spring, was to see Yosemite in the winter. 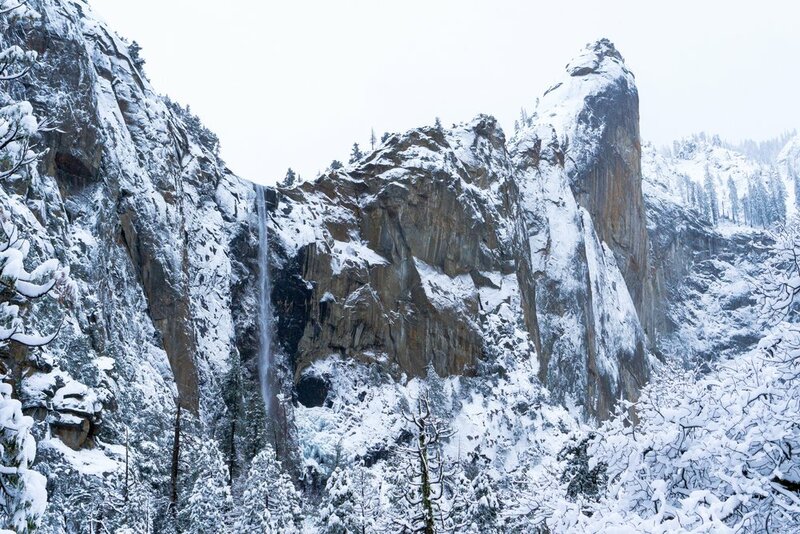 Specifically, to see Yosemite Valley blanketed in snow. My favorite Yosemite hiking buddy (my mom) and I were looking at our calendar after our last Yosemite trip in February and realized that only one weekend would work for us to re-visit Yosemite before I left for the PCT. 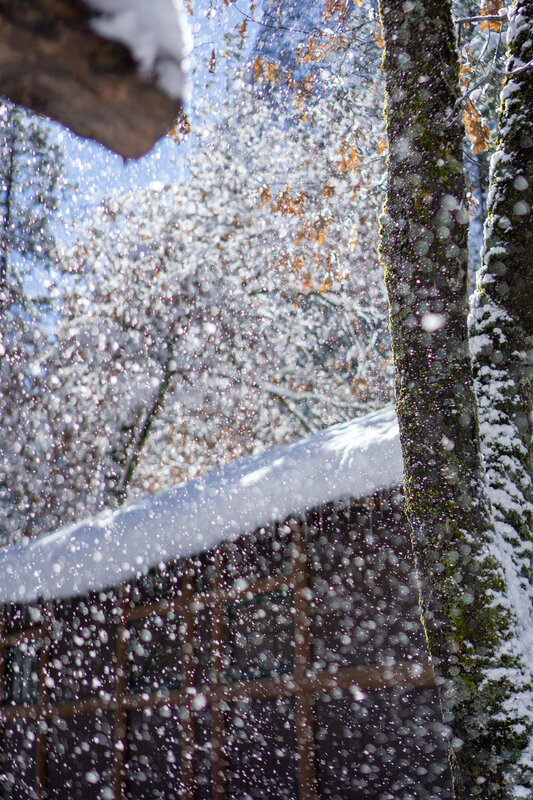 And it just so happened that the biggest storm of the season ended up blowing through the Sierra the weekend we planned to go back. 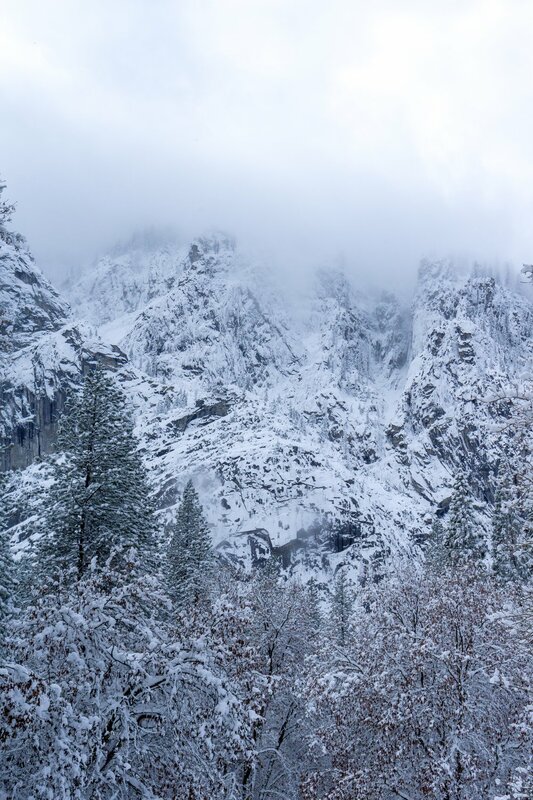 Needless to say, we were so excited to finally see Yosemite Valley in snow. Once we got to the valley floor, we couldn't withhold our excitement. Checking into our cabin at Half Dome Village just had to wait. Because we drove into Yosemite early Saturday morning, we were starving, and knowing that we wouldn't be back in Yosemite for quite some time, we knew we needed to splurge on the breakfast buffet at the Ahwahnee. It was glorious, as always (why is the fruit so fresh at the Ahwahnee?! Like, its always sooo good and juicy and ripe). After breakfast, we walked the grounds, enjoying the powdery snow. After breakfast, we decided to just walk around the valley and enjoy all of the snow! It was so special being in the valley - a normally crowded place - when it was so empty. My mom and I agreed that snow seems to quiet everything, and walking around the valley with snow lightly falling was just so serene, so peaceful, and so beautiful. We had so much fun frolicking in the snow and seeing all of our favorite places with a sheet of white covering them. But soon enough, the snow started coming down harder, and it was getting colder and darker, so we headed for the shuttle to take us back to Half Dome Village so we could get our favorite make-your-own pizza from the cafeteria (its sausage, pineapple, mushrooms, and banana peppers, if you were wondering. And yes, we get this combo every time. We're creatures of habit). We were so exhausted from our early wake-up time and walking all day that we passed out at 8:00 pm. The next morning we were on a sunrise-chasing mission and it was fabulous. It was 20 degrees F out, but there was not a cloud in the sky and the day could not have started any better. 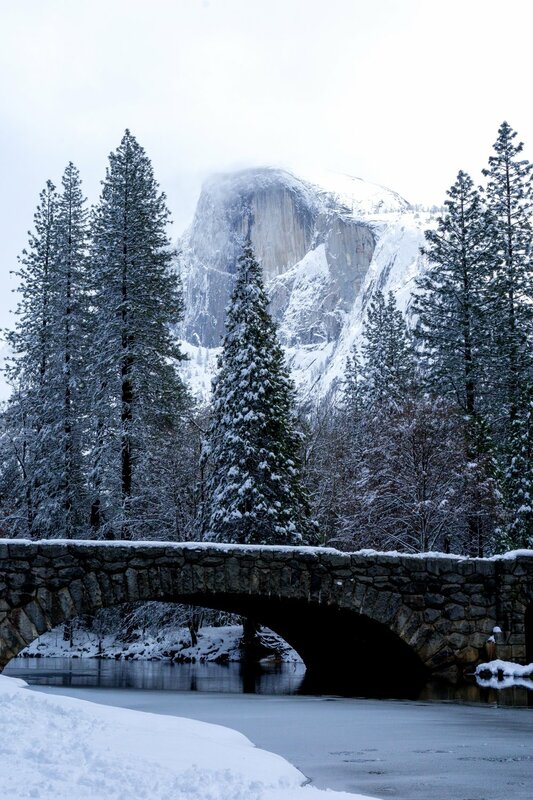 We ended our lovely snow-filled weekend with a little hike around Mirror Lake, aka the most crowded spot in Yosemite when it snows. Despite the number of people, it was beautiful and peaceful. 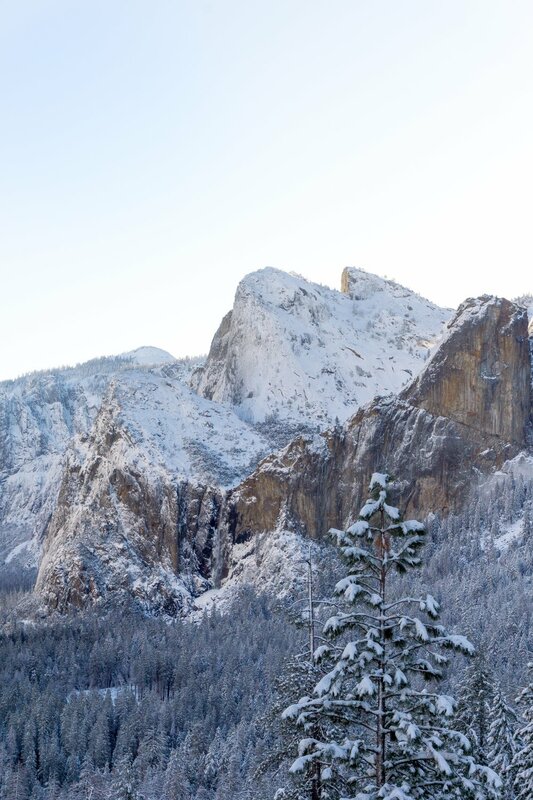 I am so lucky to have the best mamma in the world who loves Yosemite and hiking as much as I do! It was so nice to have this weekend with her in our favorite place before I leave for the PCT. Next time I see you, Yosemite, I'll have walked 930 miles to get to you! I want to start off with saying thank you to everyone who supported me in 2017 - family, friends, blog & Instagram followers. I appreciate the kindness and that you care to read about what I do & think about! 2018 is going to be a pretty big year for me. Hiking the Pacific Crest Trail is my big thing for the year, with good reason - it will take me 5-6 months to complete! Basically half of the year! In the spirit of not dwelling on the past, I won't rant about the last year, but it had it's ups and downs, and I didn't start the year with any goals/ resolutions/ intentions, which I think left me aimless. So I want to start 2018 off with more positivity and more of a game plan. Here's what I want to focus on - more or less in chronological order since my year is very structured. I always talk about having too much stuff and no where to put things. Too many clothes, too many trinkets, too many filled boxes in the basement. I already started selling some clothes & shoes on the website Poshmark in the fall to clear out my closet a little bit and make some cash at the same time! Now I just need to do the same for all of the other junk I have. I also want to reorganize my bedroom, which will come much easier after the decluttering. At least I got the camera gear all organized & nice enough looking (hey, its not all laying on the floor anymore - big win). I especially want to do a lot of this before I leave for the PCT, but I have a feeling more decluttering will happen after the trail too. This one will completely fly out the window once I step foot on the PCT (at least in the eating part), but up until then, I want to get back to eating healthier, exercising more frequently, drinking more water, and getting consistent sleep. I was doing really well in 2016, but 2017 was a bad year for healthy living. It was so easy to get stuck in that I'm tired from work - don't want to work out - meal prep is hard - eat bad food - be more tired and bloated and in a bad mood cycle. Now that I'm working less, I hope to be more motivated in meal prep and going to the gym. I know that eating better & working out make me feel better, but sometimes it can be so challenging! I'm also going to try to eat less meat. I love meat, especially red meat, but I know its not the best for you or the planet, and I'm actually more of a pescatarian 50% of the time anyways, so this one won't be that difficult. But once I get on the PCT I will literally eat anything & everything. Establishing a more consistent workout routine is also important to me leading up to the PCT. I loosely follow Kayla Itsines's BBG SWEAT program which is a combination of steady state cardio, HIIT, and plyometric and weight training for 6 days/week. To put a PCT spin on things, I am aiming to do at least one cardio session/ week as a hike ranging from 5-10 miles, and the other 2/ week will be a combination of treadmill, stair stepper, and vinyasa yoga. This is literally always a goal of mine and I'm pretty bad at it. I have a hard time not buying myself things that I want ("I worked hard for this, I deserve it"), but being unemployed for half of last year helped me not go crazy with the shopping. And I go to Starbucks for coffee (& food) almost daily, and eat out way too much. Making some changes here will help me be healthier & save more money, and I need to save all the money I can for the PCT - to enjoy the trail, and to have some money at the end! Obviously a big one for the year! I am attempting a northbound thru-hike of the Pacific Crest Trail (...if you couldn't already tell), and plan on completing the whole thing this year. Hopefully I have lots of good luck - no injuries, great weather, etc. that will allow me to complete all open miles of the trail this year. If you want to read more about my PCT prep, mosey on over to my PCT blog. A little out of the blue here, but I'd really like to learn XC skiing. I enjoy snowshoeing a lot, but I feel like XC skiing gives you more opportunity for exploration in the winter, so I'd really like to learn it! Mindfulness & planning for the future are not two things you normally see in the same sentence. However, I am going to be taking a very long walk this year, and I know I will think about a lot of things when my mind starts to wander. The PCT is supposed to be fun, of course, but I do hope it also helps me take stock of my life & realize where my priorities lie - and in a non-judgmental way. This is literally the first year since I graduated from college where I've stopped telling people "I'm applying to grad school this year", so it will be nice to quit unintentionally lying to everyone. That being said, maybe I'll be able to think about applying to something in 2019? Not pushing anything though, which is nice for once. I'm bad at communicating with people in a personal manner. Professional - no problem. Personal... could be better. It's funny that I'm attempting to improve on this the year I will be mostly in the woods... but I guess you have to start somewhere, am I right? Do you have any resolutions you'd like to share - outdoors related or not? Let me know in the comments & have a Happy New Year! Welcome to my new website! I’ve made lots of changes since the creation of pacificpines back in 2015 (if you’re new, you’re not missing much). The biggest (outward) change is the name of the website! pacificpines was an homage to the fact that I live on the West Coast and I like pine trees *super creative*. Backcountry Emily came about by wanting to make it apparent that there’s a person behind this blog (me, Emily!) that loves to adventure (especially in the backcountry) and loves to help people. The content will be mostly the same, but with more fun stuff, and organized so much better thanks to switching hosting sites. You’ll get to see my photography (maybe have a chance to purchase prints in the future) and read about different excursions via my point of view and also with more objective information: stats, costs, logistics, and how-tos. I’ll also be sharing my thoughts on gear, food, and backcountry “realisms”: I promise I won’t sugarcoat some things. For the next few weeks and months I’ll be cataloging some older trips that I never documented and adding new ones, as I have at least two backpacking trips before Thanksgiving. I hope to give some insight into my first pieces of gear as a newbie and how I’ve evolved my gear and packing lists as I’ve learned more. I’m also preparing for some bigger future things, and I’ll be posting about that in the months to come as well! Thanks for checking out my site and reading this! Hope you stay tuned for more. If you want to ask me any questions, just scroll down and click the “contact” button and I’ll help you out!